There are many articles claiming that Richard Spencer called for a "peaceful ethnic cleansing". "We have experienced this mass migration of people" into the United States, Spencer said. "Therefore they could go home, you can go home again. ... They came here peacefully. They could leave peacefully." However, most articles surround the phrase with quotes, so I am assuming that it is a direct quote. 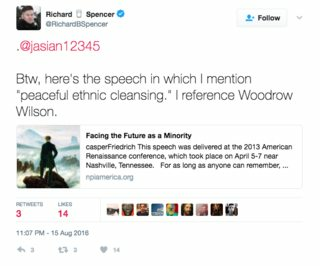 Has Richard Spencer called for a "peaceful ethnic cleansing" in those words? Are these quotes from a book by Richard von Coudenhove-Kalergi? Was there ever a cable channel called The Puppy Channel which broadcasted for three years?